Caley Thistle midfielder Joe Chalmers. Caley Thistle midfielder Joe Chalmers was relieved to end his long wait to find the net after scoring his first career goal in Saturday’s 3-1 Championship victory against Queen of the South. Chalmers gave Inverness a 2-0 lead just short of the half-hour mark, with a low 20-yard shot which trundled past goalkeeper Jack Leighfield after Iain Vigurs had put Caley Jags ahead early on. Aaron Doran netted a third before Queens substitute Owen Bell scored a late consolation. Chalmers had played the majority of his career as a left back in spells with Celtic, Falkirk and Motherwell prior to being shifted into central midfield by John Robertson following his arrival at Inverness last summer. He was thrilled with the milestone goal, which came in his 74th senior career appearance. He said: “It was my first career goal, so I’m obviously delighted with it – although it was probably one of the worst shots I’ve hit. “I was glad to see it hit the back of the net. The boys were giving me a bit of stick for it but it doesn’t matter to me. “The ball was a bit behind me from my first touch. I swung at it but I didn’t quite catch it as I wanted but the closer it got to the goal I started thinking it might go in and luckily enough it did. “Apart from that, it was a big time for us to get the second goal and made it a bit more comfortable. “I’ve had a few near misses and I’ve maybe come a bit closer since I’ve moved to midfield. It gives me a chance to get on the scoresheet a bit more. Chalmers is keen to contribute further to Caley Jags’ goal tally, adding: “I think it’s massive for the goals to be spread around the park. Looking at any teams that do well, who are in form, they’ve got goals from all over. 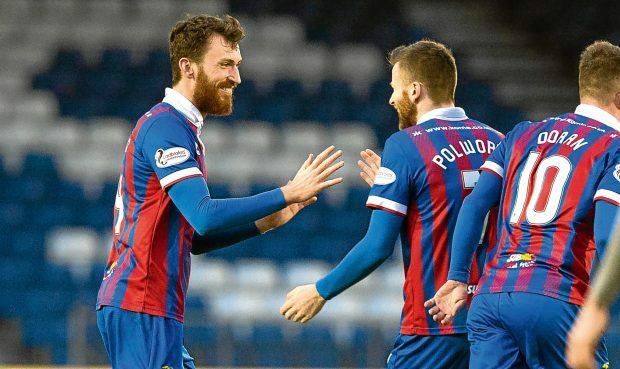 The result moves Inverness into sixth place, keeping them three points adrift of the play-offs, and Chalmers is pleased with the progress his side is making. He added: “We’re bang in there. After such a bad start the manager always said if we can get to February and still be in touch we will give it a right good go.